Rough Opening – The size of the hole in your door needed to accommodate the Freedom Pet Pass cat door. Frame Size – The overall size of the frame on the pet door; the footprint of the cat door on your human door. 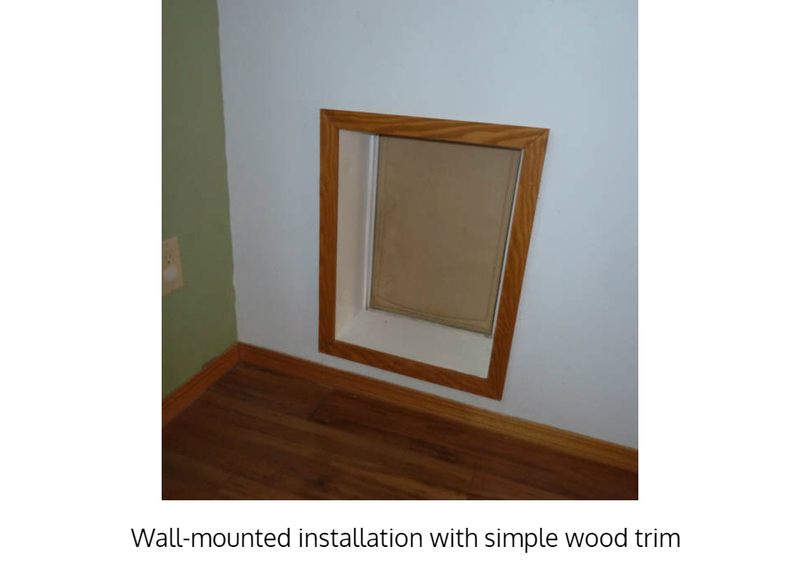 Installation of any wall-mounted pet door involves putting a hole in the exterior envelope of your home and should therefore be done with great care. Always consult building codes and get proper permits. If you are unsure about your abilities, contact a licensed contractor. The Freedom Pet Pass wall-mounted pet door is designed to install and trim out much like a vinyl window. This allows for a code-compliant and energy-efficient installation using techniques that are well-established. This project requires moderate-to-advanced DIY skills or professional installation. Our doors come with illustrated written instructions, and there are step-by-step video instructions available here: link. The cellular PVC used in our frame is 3,000X more insulating than the aluminum material used in the frames of lesser kittie doors. 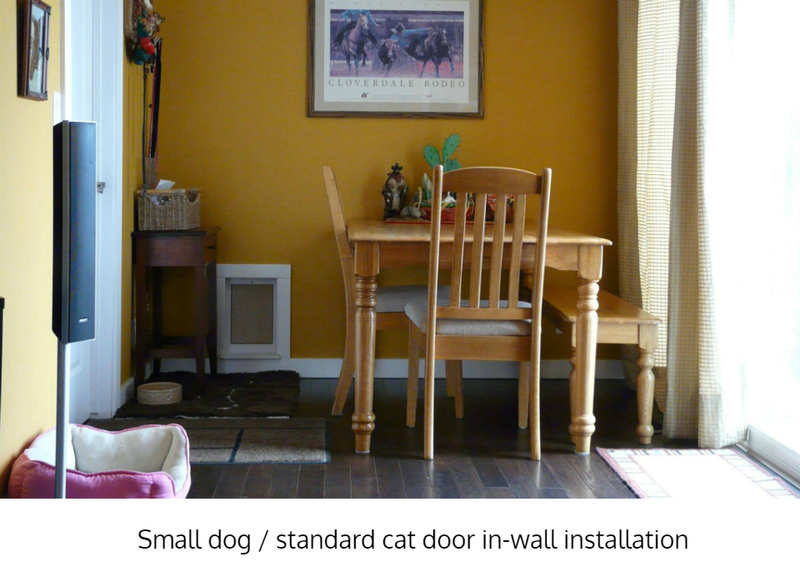 Many cat doors “claim” energy-efficiency with bogus comparisons and no proof. 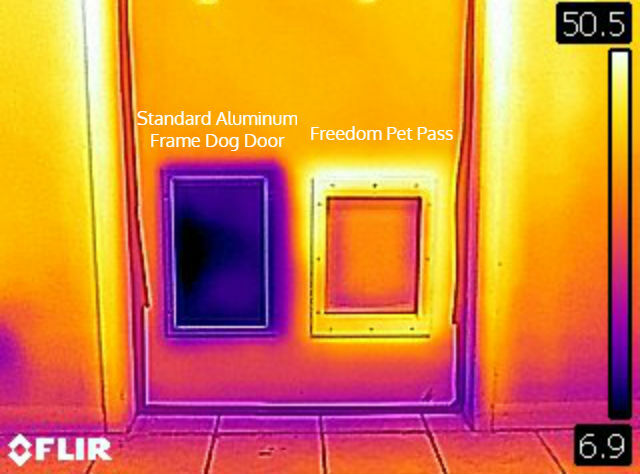 Freedom Pet Pass cat doors have extensive independent laboratory testing that prove how efficient they are. Our doors are evaluated using the same tests that are used for Energy Star certification for windows and human doors, and the results show that Freedom Pet Pass doors are 15X better at blocking outside air than requirements for human doors. Cellular PVC Frame – Strong, weatherproof, and mold-resistant, and 3,000X more insulating than metal frames used on lower-end cat doors. Locking Security Panel – The locking security panel is made from 100% acrylic, the same material used in many grades of bulletproof glass. The “up-and-in” insertion of the panel means no additional clearance is needed around the pet door. note: to prevent injury to pets and damage to the door, do not use the security panel to lock your pets outside. 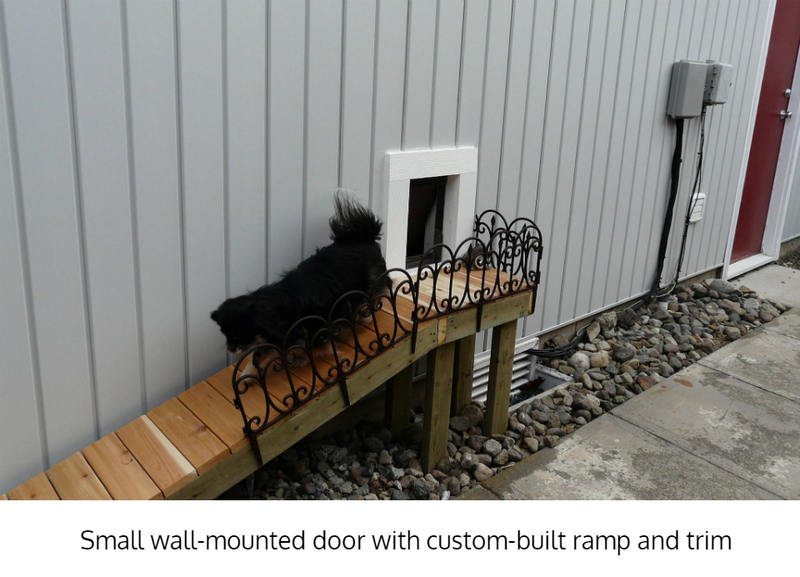 Freedom Pet Pass wall-mounted pet doors are made for new construction applications and major remodels. They are designed to be installed at the same time as windows and doors using the same techniques. 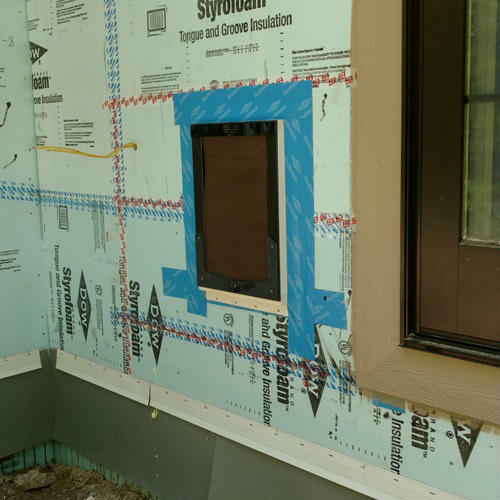 Builders will appreciate the window-like design that allows for the use of sill pan flashing, and the included nail fin will allow them to properly integrate the pet door into the weather barrier system. 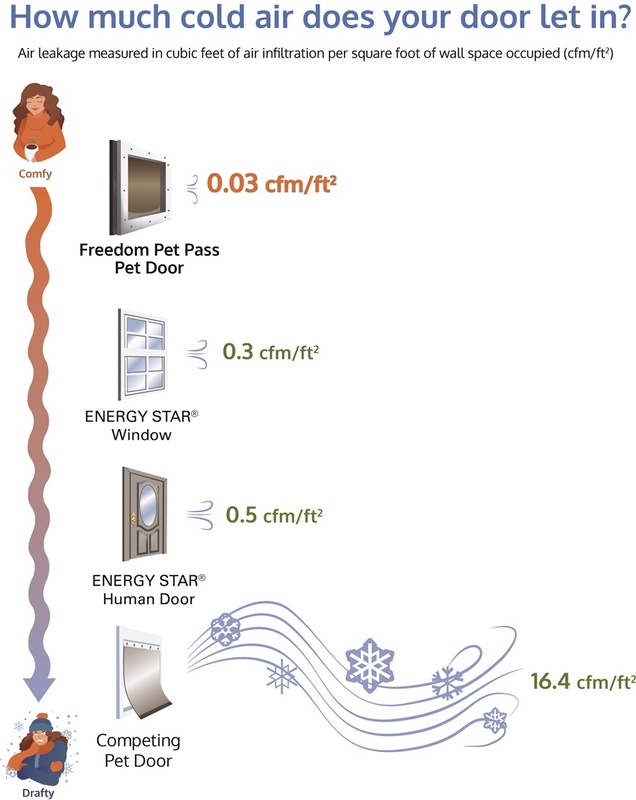 All Freedom Pet Pass doors come with energy-efficiency ratings attached for easy reference by code officials. How hard is it to open the cat door? Pretty much any cat has the physical capability to open a Freedom Pet Pass pet door. If your pet can push open an unlatched interior door, he or she is capable of using a Freedom Pet Pass cat door. How secure is the pet door? The locking security panel is made from the same acrylic as some grades of bulletproof glass. 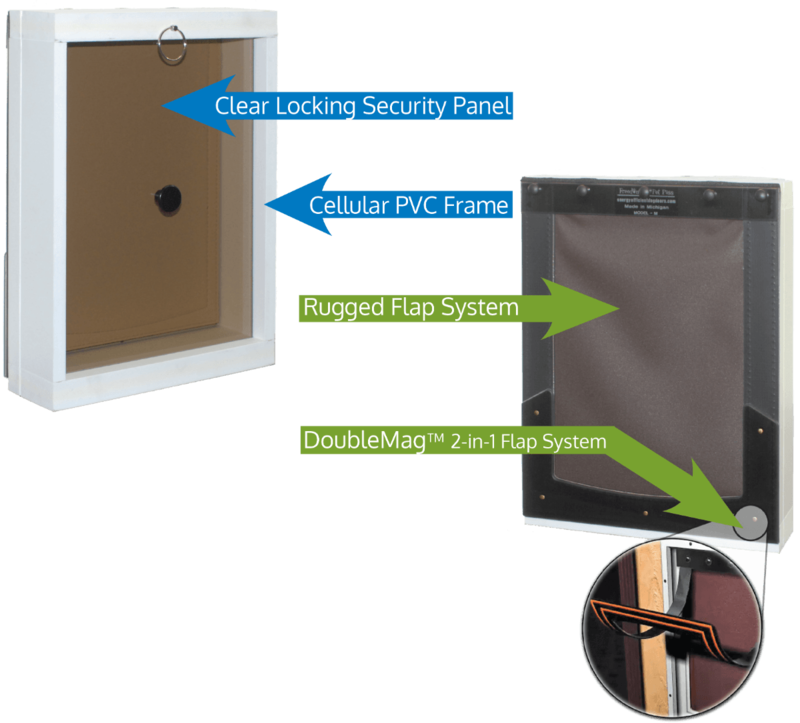 When the panel is in place, the pet door is as secure as a locked door or window. Not impenetrable, but difficult to access without breaking something. I have one cat door and one dog door in my house. Best ever! In one year alone that cat door saved me over 400 gallons of propane and no, that is NOT a typo four HUNDRED gallons! Paid for itself 3 times over! Now I'm buying one for my garage. I live in Nebraska and these doors are perfect for our blustery winters. It might seem expensive but when you look at the savings, you can NOT lose.